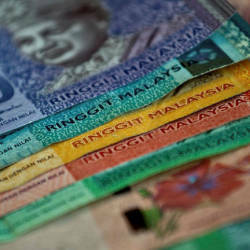 13 Feb 2019 / 12:31 H.
PETALING JAYA: The volume index of wholesale & retail trade expanded 8.1% to 173.8 points in the fourth quarter of 2018 (Q4) as compared to the same period in 2017, bringing the full year volume index to record a growth of 7.7% year-on-year to 168.9 points. 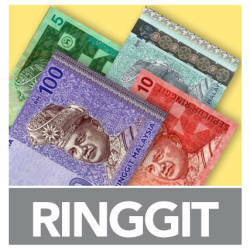 The Statistics Department said growth in Q4 was driven by retail trade with an 11.8% jump. Volume index of wholesale trade grew 6.2% to 182.2 points in Q4 as compared to fourth quarter 2017, supported mainly by non-specialised wholesale trade (9.9%) and wholesale of household goods (9.1%). In Q4, the retail trade sub-sector registered a growth of 11.8% to 183.3 points year-on-year, driven by retail sale of information and communication equipment in specialised stores (15.1%) and retail sale of other goods in specialised stores (13.2%). Volume index of motor vehicles which includes parts and accessories posted an increase of 1.9% to 127.5 points in Q4 as against the same quarter 2017, contributed by sale, maintenance and repair of motorcycles and related parts and accessories activities (6.4%). 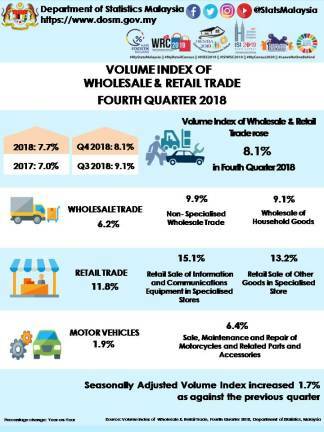 Meanwhile, the seasonally adjusted volume index of wholesale & retail trade went up 1.7% as against the third quarter 2018, propelled by wholesale trade sub-sector with 2.6%.